252. The curb is usually built just in advance of the sidewalk. The foundation is prepared similarly to that of walks. The curb is divided into lengths similar to that of the walk; and the joints between the blocks, and also between the walk and the curb, are made similar to the joints between the blocks of the walk. The concrete is generally composed of 1 part Portland cement, 3 parts sand, and 5 parts stone, although a richer mixture is sometimes used. A facing, on the part exposed to wear, of mortar or granolithic finish, will improve the wearing qualities of the curb. There are two general types of curb used - a curb rectangular in section, and a combined curb and gutter; both types are shown in Fig. 83. The foundation for either type is constructed in the same manner. Both these types of curb are made in place or moulded and set in place like stone curb, but the former method is preferable. A metal corner is sometimes laid in the exposed edge of the curb to protect it from wear. The construction of the rectangular section is a simple process, but requires care to secure a good job. This is usually about 6 inches wide and from 20 to 30 inches deep. After the foundation has been properly prepared, the forms are set in place. Fig. 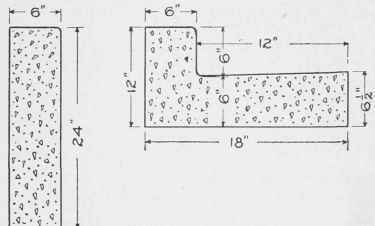 84 shows the section of a curb 6 inches wide and 24 inches deep, and the forms as they are often used. The forms for the front and back each consist of three planks 1 7/8 inches thick and 8 inches wide, and are surfaced on the side next the concrete. They are held in place at the bottom by the two 2 by 4-inch stakes, and at the top the stakes are kept from spreading by a clamp. 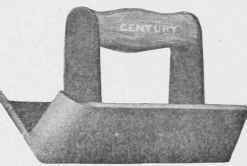 A sheet-iron plate 1/4 inch thick is inserted every 6 feet, or at whatever distance the joints are made. 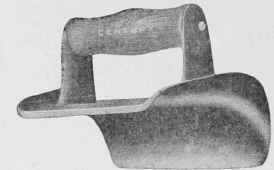 After the concrete has been placed and rammed, and has set hard enough to support itself, the plate and front forms are removed, and the surface and top are finished smooth with a trowel; the corner being rounded with an edger, as shown in Fig. 85. The joint is usually plastered over, and acts as an expansion joint. 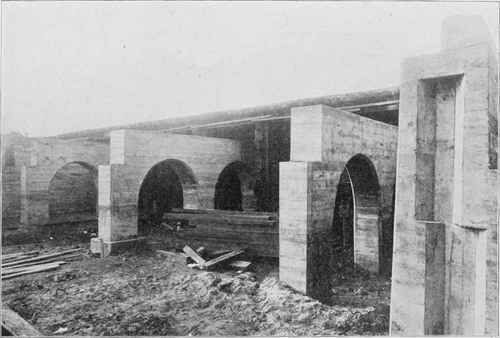 The forms on the back are not removed until the concrete is well set. 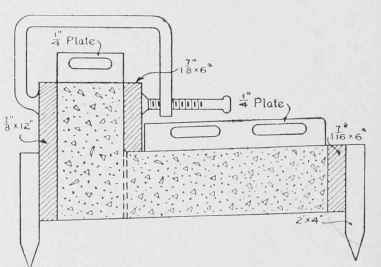 If a mortar or granolithic finish is used, a piece of sheet iron is placed in the form one inch from the facing, and mortar is placed between the sheet iron and the front form, and the coarser concrete is placed back of the sheet iron (Fig. 86). The sheet iron is then withdrawn and the two concretes thoroughly tamped. Fig. 83. Typical Curb Sections. Fig. 84. Forms for Constructing Curb. Fig. 86 shows the section of a combined curb and gutter, and the forms that are necessary for its construction. This combination is often laid on a porous soil without any special foundation, with fair results. A 1 7/8-inch plank 12 inches wide is used for the back form, and is held in place at the bottom by pegs. The front form consists of a plank 1 7/8 by 6 inches, and is held in place by pegs. Before the concrete is placed, two sheet-iron plates, cut as shown in the figure, are placed in the forms, six feet to eight feet apart. After the concrete for the gutter and the lower part of the curb is placed and rammed, a 1 7/8-inch plank is placed against these plates and held in place by screw clamps (Fig. 86). The upper part of the curb is then moulded. When the concrete is set enough to stay in place, the front forms and plates are removed, and the surface is treated in the same manner as described for the other type of curb. Fig. 86. Forms for Curb and Gutter. Fig. 88. 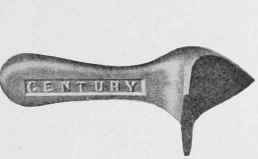 Inside Angle Tool. The cost of concrete curb will depend upon the conditions under which it is made. Under ordinary circumstances, the contract price for rectangular curbing 6 inches wide and 24 inches deep will be about $0.60 per linear foot; or $0.80 per linear foot for curb 8 inches wide and 24 inches deep. Under favorable conditions on large jobs, 6-inch curbing can be constructed for $0.40 or $0.45 per linear foot. These prices include the excavation that is required below the street grade. The cost of the combined curb and gutter is about 10 to 20 per cent more than that of the rectangular curbing. In addition to having a larger surface to finish, the combined curb and gutter requires more material, and therefore more work, to construct it. 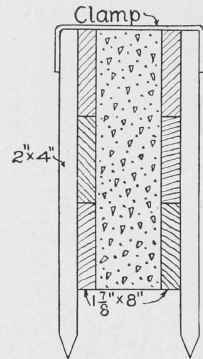 REINFORCED-CONCRETE BENTS FOR SUPPORTING REINFORCED-CONCRETE BRIDGE SLABS. Reinforced with "Johnson" corrugated bars. Track elevation of Illinois Central Railway, Chicago; A. S. Baldwin, Chief Engineer; R. E. Gaut, Bridge Engineer. Courtesy of Expanded Metal & Corrugated Bar Co., St. Louis, Mo.